Home→Things To Do In the Mountain Empire; Sonoita, Patagonia, Elgin! Things To Do In the Mountain Empire; Sonoita, Patagonia, Elgin! Here are our recommendations for Things To Do in Sonoita, Patagonia and Elgin as well as dining and lodging suggestions. They call this the Mountain Empire. Fair enough. Driving south from Tucson on these scenic highways, you can see the Santa Rita Mountains to the west, Whetstone Mountains to the East, Hauchuca Mountains to the southeast, and the Patagonia Mountains in the southwest. But in between are rolling hills, tall grass, herds of cattle, and a dozen vineyards. The scenery looks nothing like the desert environment surrounding Tucson. (A) Tucson; (B) Empire Ranch; (C) Sonoita; (D) Elgin; (E) Patagonia. Approx. 90 miles. More than a century before this was wine country, it was cattle country. The biggest ranch was the 100,000 acre Empire Ranch. You can visit what remains of it on your way from Tucson to Sonoita. Volunteers are working to restore the principle residence & out buildings. Inside the main house are simple exhibits with old photographs of the ranch and its ranchers. Definitely worth an hour’s detour. Don't miss the Empire Ranch Fall Roundup every November. Wineries are fairly new to this part of Southern Arizona. Each winery creates several varietals each year, most of which don’t taste at all like the excellent wines we get from California, Oregon, France, Argentina, Chile, or New Zealand. This is not to say Sonoita & Elgin wines are not as good. It is simply to say they taste different. The climate, soil, and water here are different, so the grapes grown in this region produce unique flavors. Chris of Rancho Rossa Vineyards inspects his 2014 crop. Visitors by the thousands come here in tour buses, shuttle vans, and limos. The advantage over driving your own car is you don’t have to be the designated driver and are free to sample all the wine you want. Check out this link for more information about Southern Arizona Guide's guided tours. In short, for $135 each, we will take you to four of our favorite wineries. At each winery you can sample 7 to 9 of their wines. In between, we have a fine lunch (with wine) at Chef Adam Puckle's The Cafe'. By the end of the day, you will have sampled about 30 different wines. Our guests also get a discount on wine purchases. Most of the folks who own & operate these small wineries are hard-working farmers and creative wine makers. We don’t know anyone who has gone wine tasting down here who didn’t have a fine day trip experience. Keep an eye out for pronghorn deer! Find out more about Sonoita / Elgin wineries, including a map, CLICK HERE. 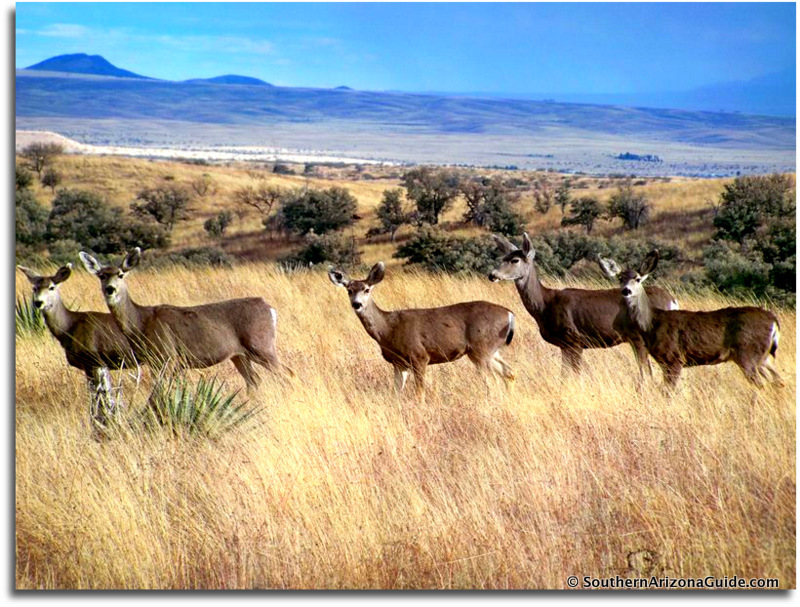 Deer in the grasslands near Sonoita. Photo by Sally Reichardt. Within the village are several shops along west side of the main highway through town, such as Gracye's Gift & Candle Shop, and a visitors center in Metamorphosis Art Gallery with local information, including maps to the ghost towns of Harshaw & Washington Camp. The next street east of the main highway is McKeown Avenue where you will find the Stage Stop Hotel (you can't miss it) and many quaint shops worthy of your attention, including Ovens of Patagonia; Creative Spirits Artists Gallery; Global Arts Gallery and Lillian's Closet; and Mesquite Grove Gallery. Just down the sidewalk from the hotel is Gathering Grounds. Think of it as a rustic Starbucks. Here you will find good, fresh coffee and pastries and friendly people. Global Arts Gallery & Lillian's Closet. Patagonia, AZ. Nearby Gathering Grounds are several splendid shops selling local arts and crafts of considerable beauty and workmanship. One is Creative Spirits Artists Gallery, original arts & crafts by a consortium of local artists. Another is Adrienne Halbert's Global Arts Gallery and Lillian's Closet. And don't miss Regina Medley's Mesquite Grove Gallery. Regina has a cute vacation rental behind her gallery as well as Cross Creek Cottages less than a half mile north of the village. Red Mountain Foods, a Patagonia grocery store for fresh produce and grass-fed beef. Ovens of Patagonia Bakery & General Store. Paton House. This former residence of Wally & Marion Paton was recently purchased by the Tucson Audubon Society in order to preserve this famous bird watchers' mecca. The modest home, backyard and adjacent 5 acres abuts the Patagonia - Sonoita Creek Preserve. Over 200 species of birds, including the rare violet crowned hummingbird, have been spotted here. The Cafe in Sonoita on Highway 82 just east of the intersection of 83 and 82. Lunch is served daily from 11AM to 2PM. Salads, sandwiches, burgers. Dinner is served Thursday - Saturday 5 to 8. Salads, pastas, fish & chips, prime rib and chicken dinners. Plus, check out the specials written on the chalkboard. All very good. A new restaurant is in town, just east on HWY 83, The Vineyard Cafe. Recommended. Call for hours. Wild Horse Restaurant is in the Stage Stop Hotel. When we were there most recently (September 2014) the hotel and restaurant were undergoing extensive renovation. So we will revisit in November and let you know. Duquesne House B&B, Patagonia, AZ. The Duquesne House Bed & Breakfast. Definitely! Comfortable. Splendid patio & gardens. Say "Hi" to Nancy, the innkeeper, for us. Circle Z Ranch. If you're a hiker, birder, and a horseback rider, this guest ranch has it all. All activities and three excellent meals each day are included in the price of your stay. Circle Z has 7 historic, comfortable, Spanish-style adobe guest cottages. They vary from individual rooms to suites with living rooms or entirely private cottages. Circle Z offers special activities for young children and, with 80 horses raised and trained on the Ranch, a horse for every riding ability. Highly recommended! Cross Creek Cottages. Here you will find four cottages on 26 acres surrounded by fields, and shaded by mature pine, ash, and mesquite trees. Sonoita Creek runs through the property. Regina Medley is your hostess. And yes, those are her rescue burros in the adjacent field. Their friends, the lama and alpaca are there too. Each cottage is furnished and decorated in comfortable country style and has its own full kitchen. Regina is a textile artist and owner of Mesquite Grove Gallery in Patagonia. She offers a quaint little house for nightly rental immediately behind her gallery. Stage Stop Hotel. When we were last in Patagonia (September 2014) This hotel and its Wild Horse Restaurant were undergoing extensive renovation. We will bring you an update when we return in November. For more information about what to see and do in Santa Cruz County, CLICK HERE.